The Single CV Programmer lets you easily read and write CV values in DCC decoders. It can (usually) be found in the "Programmers" submenu of the "Tools" menu. At the top are two buttons for "Read" and "Write". 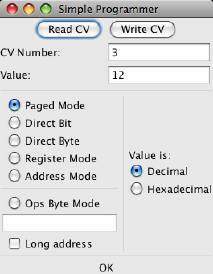 Before you use them, you should put in the CV Number (address), and if you want to do a write, the new value. Below that on the left is a place to select the programming mode. Modes that your command station can't provide are disabled and can't be selected. If you select an "ops" mode, which does programming on the main track, you need to enter the address of the decoder to be programmed. Depending on your DCC system, you might need to check the "Long address" box if this is a long address; for some DCC systems, JMRI can figure that out from the address. Some DCC systems don't allow you to read on the main, in which case the "read" button will be disabled. To the right of that is a place where you can select either Decimal (base 10) or Hexadecimal (base 16) for the input values.